CEBAF can now deliver its full-energy electron beams. Jefferson Lab begins a new era of research upon completion of the 12 GeV Upgrade of the Continuous Electron Beam Accelerator Facility. NEWPORT NEWS, VA – Nuclear physicists are now poised to embark on a new journey of discovery into the fundamental building blocks of the nucleus of the atom. 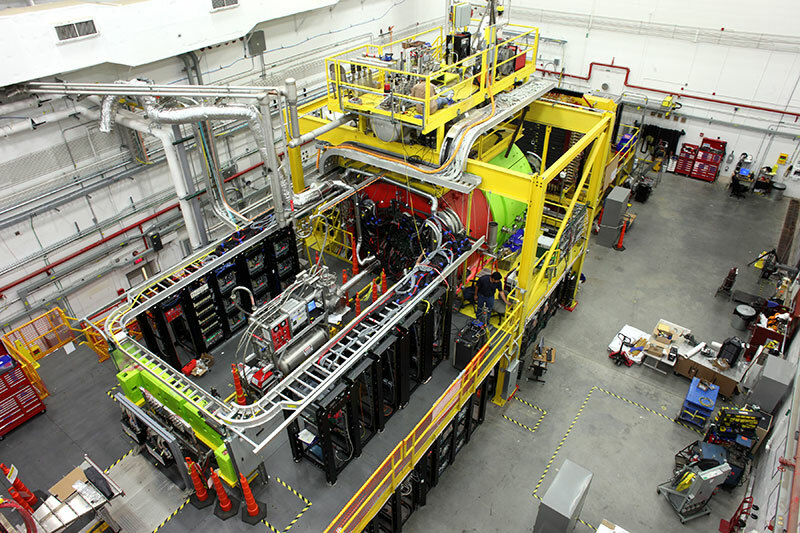 The completion of the 12 GeV Upgrade Project of the Continuous Electron Beam Accelerator Facility (CEBAF) at the Department of Energy's Thomas Jefferson National Accelerator Facility (Jefferson Lab) heralds this new era to image nuclei at their deepest level. The unique capabilities of the newly upgraded CEBAF pushes the boundaries of the precision frontier ever deeper into the heart of matter and enables a full range of research opportunities. Completed on time and on budget, the $338 million upgrade has tripled CEBAF's original operating energy and commissioned a new experimental area dedicated to providing insight into one of the universe’s great mysteries: why the fundamental constituents of matter, quarks, may never be found in isolation. The three existing experimental areas were also upgraded to allow the 3D imaging of the quarks in nuclei and to facilitate unique searches for new physics. Project completion follows on the successful commissioning of the last two experimental areas in the spring. Jefferson Lab staff then worked diligently to install and commission the last, individual pieces of equipment needed for full operations in each of its four experimental halls. With that work completed, the laboratory received official notification from DOE on Wednesday, Sept. 27, of the formal approval of Critical Decision 4 (CD-4), Approve Project Completion and Start of Operations. “The advanced capabilities of the upgraded CEBAF accelerator and detectors to search for exotic new particles, departures from nature’s symmetries, and details of quark behavior inside nuclei at a scale previously inaccessible promise a truly exciting watershed of scientific discovery,” said Dr. Tim Hallman, Associate Director for Nuclear Physics in DOE’s Office of Science. CEBAF, an Office of Science User Facility, is the world's most advanced particle accelerator for investigating the quark structure of the atom's nucleus. Based on superconducting radiofrequency (SRF) technology, the accelerator produces a stream of charged electrons that scientists use to probe the nucleus of the atom, its protons and neutrons, and their quarks and gluons. Its higher energy electron beams provide the cleanest probes of nuclear matter at the highest intensities ever achieved, enabling precision experiments that were once thought beyond our reach for deepening our understanding of nuclear matter. The CEBAF accelerator was originally designed to provide electrons at energies of 4 billion electron-volts, or 4 GeV, although efficiencies in its design and extensive experience in running the facility allowed Jefferson Lab operators to eventually achieve 6 GeV electron beams in its original configuration. The $338 million, multi-year 12 GeV CEBAF Upgrade Project tripled CEBAF's original operating energy. The project entailed the addition of 10 new accelerating units to CEBAF to increase its energy, the construction of a fourth experimental hall, as well as an additional arc of magnets and an extension of the accelerator tunnel to deliver beam to the hall. 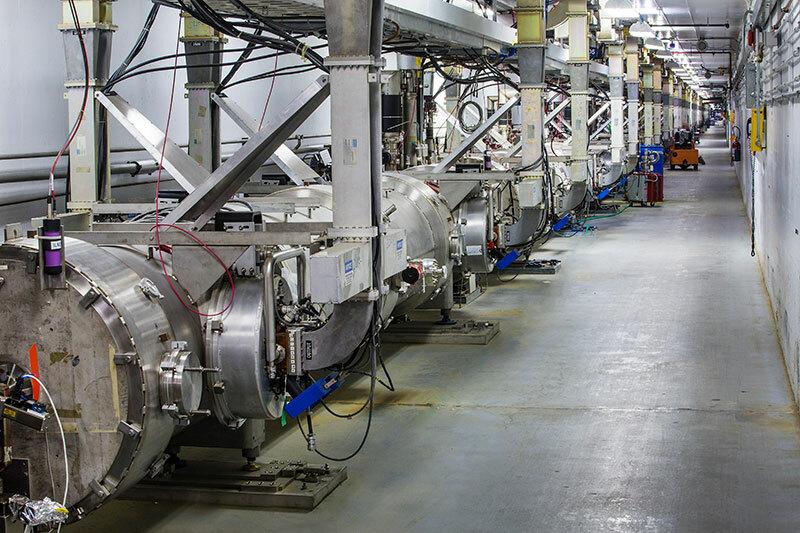 In addition, other utility and equipment upgrades were made, including an addition to the refrigeration plant that enables CEBAF’s SRF technology and new and upgraded equipment to the existing experimental halls to capitalize on the more energetic electron beams for experiments. CEBAF can now deliver its full-energy electron beams, up to 12 GeV, to the Hall D complex, and up to 11 GeV electron beams into its original experimental areas, Halls A, B and C.
The newly upgraded CEBAF enables a diverse and compelling program of experiments proposed by the lab’s 1,500-member community of scientists who come to Jefferson Lab from around the world to conduct their research. With the upgraded machine, scientists will probe how quarks interact, how they spin, and how they are distributed inside protons and neutrons. CEBAF’s energetic probes and precision beams will enable the first three-dimensional views of the structure of protons and neutrons. And researchers have already initiated groundbreaking studies of the strong force, the force that glues matter together, in the laboratory’s newest experimental hall. Scientists will also use CEBAF to push the limits of our understanding of the Standard Model of Particle Physics, a theory that describes fundamental particles and their interactions in terms of the strong, weak and electromagnetic forces. CEBAF probes the Standard Model in two ways: by testing its predictions for the structure of protons and neutrons, and also by testing its completeness with high-precision measurements at low energies, where discrepancies could reveal signatures of new forms of matter. The extension of CEBAF’s experimental reach into the heart of matter has drawn the interest and kindled excitement of researchers worldwide. The laboratory’s User community has grown from 1,200 in the pre-12 GeV Upgrade era to more than 1,500 today. 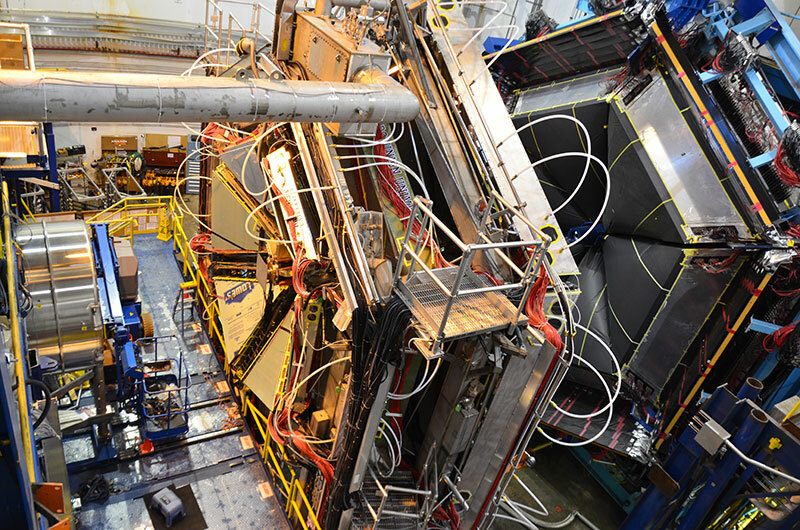 Thus far, 78 experiments have been approved for running with the 12 GeV upgraded CEBAF. Of those, four experiments were already completed during the initial facility commissioning and ramp up. CEBAF is currently scheduled to begin full operations in December. 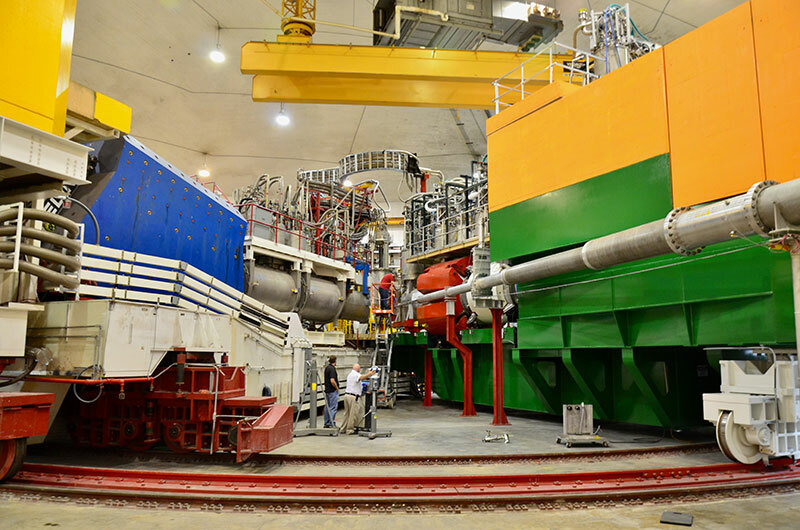 The 12 GeV CEBAF Upgrade Project began in 2004, when the DOE recognized that it filled a “mission need” in the field of nuclear physics with the approval of Critical Decision Zero (CD-0). This critical decision process approval allowed the laboratory to proceed with conceptual design, and planning of project acquisition and execution. Project engineering and design efforts began in 2006, followed by finalization of project definition in 2007, start of construction in 2008 and approval of initial operations in 2014. CEBAF is the world's most powerful microscope for studying the nucleus of the atom. The CEBAF accelerator is cooled to within a few degrees of absolute zero to enable its superconducting components. If it weren't superconducting, it would require three times as much power to operate, and performance would be greatly reduced. The mass of an object increases as its speed increases, so at 12 billion electron-Volts (12 GeV), the electrons in the CEBAF beam increase in mass 23,500 times.